Highly pedigree dog available for stud! sooper producer very good progeny result dark pigmentation and very atractive male. I has insight into Apoll's history and his qualities both as individual and as stud dog. On BSZS 1995 Apoll went VA10 by Peter Messler. This was the last year Apoll competed on BSZS. The year after Apoll went to Norway for stud. 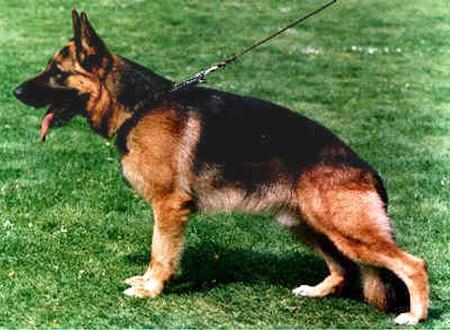 He was imported by the Norwegian GSD breeders Hilde&Leif Wangberg,kennel Gildewangen. But I met him personally and used him as a stud before that. On these occasions he still lived in Germany and was on top of his career. Apoll was a very well-educated dog with very god working ability combined with a fantastic drive and temperment! !The most objective answer to what Apoll produced regarding to terms of drive and temperment, is obtained by looking at his statistics on his progeny groups at BSZS. Peter Messler and Helmut Buss made the following comment on Apoll's progeny groups. "Ein bemerkenswert hoher Anteil der Tiere wird in den Gebrauchshundklassen vorgeführt". In addition to this, can I myself add that I over the years personally has met many of his progeny. One explanation for this fact is that Apoll and his progeny early caught my eye. I can honestly say that I never has met a Apoll progeny who has been a major public liability. But I has over the years heard a lot of "trash-talk", that is simply not true!! Apoll was also a dog of very god confirmation, which he generally inherited to his progeny. Furthermore he generally inherited a good size to his progeny. Apoll himself had a very powerful gaiting, wich he generally inherited to his progeny!! Never forget that Apoll's father was one of the pillars in Germanys GSD breed history, Jeck Noricum!! By the way I myself imported a fantastic Apoll daughter from Germany. She also was a fabulous producer and she has given me many good pup's!! And her half sister VA3 Ginger v. Blickfeuer is one of the most fantastic working class females I has seen on BSZS!! being a very sharp dog isn't necessarily a bad thing. There is a difference between being a "short-nerved" dog that lights up quickly and a dog that is "weak-nerved" that lights up for no reason. Did Apoll have questionable temperment with people and/or was he noted of producing such temperment OR was your dog just like this?...just wondering. I owned Rebeta's Hieno. He had good angles and drive, but was a major public liability. Does anyone have any insight into Apoll's working ability, drive and temperment. Also, any insight into what he produced in terms of drive and temperment? Like many, I have him in my pup's bloodlines and am curious about what he brings.